Wear these stylish earrings to enhance your daytime and evening attire. 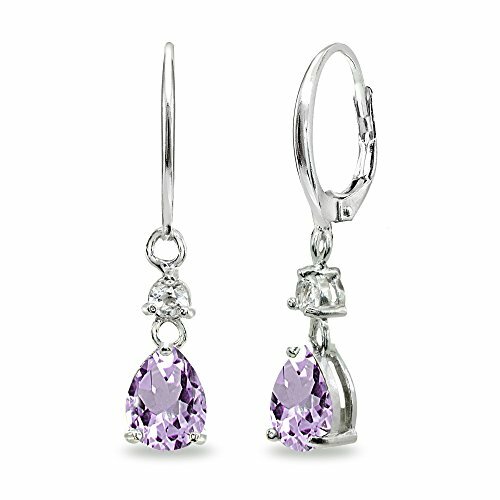 These stunning dainty earrings feature 8x6mm pear-cut stones in a dangling 925 silver setting. These dangling earrings are secured by lever-backs. The earrings are crafted of fine sterling silver and are nickel & tarnish free. FEATURE - Wear these stylish earrings to enhance your daytime and evening attire. These stunning dainty earrings feature 8x6mm pear-cut gemstones and round white topaz gems in a dangling 925 silver setting. CRAFTED - These dangling earrings are secured by lever-backs. The earrings are crafted of fine sterling silver and are nickel & tarnish free. These trendy earrings in fine jewelry are a great addition to your sterling silver jewelry and gemstone jewelry collections. It can be purchased as gifts for women, teens and girls.